"Like most artists, I started drawing before I could write. A little girl in love with everything pink, I first copied the ballerinas on my bedroom wallpaper. Luckily, over the years, a few important teachers helped me find a more original voice. In childhood, a school art teacher identified an early love and introduced me to world of texture and color that struck and important chord. "However, it was not until adulthood that I found my own inspiration. 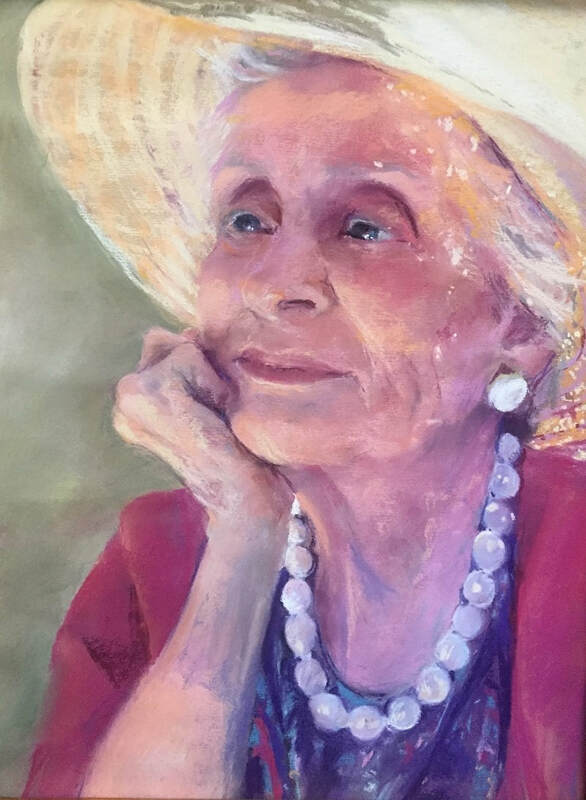 Again, it was the good fortune to find caring, thoughtful, skilled teachers that led me first to drawing monochromatic portraits, and later to painting in pastel. Through the process, I realized that the act of painting has helped me to see and to appreciate the world around me more than I ever realized. I now specialize in portraits, landscapes and still life." are enhanced in my portrait work by the gesture and sparkle that light the human face. Cindy Crimmin studied visual arts at the DeCordova Museum School in Lincoln, Massachusetts and the Art Institute of Boston. In 2011 she began private study with Jeanne Rosier Smith in her studio in Sudbury, Massachusetts. 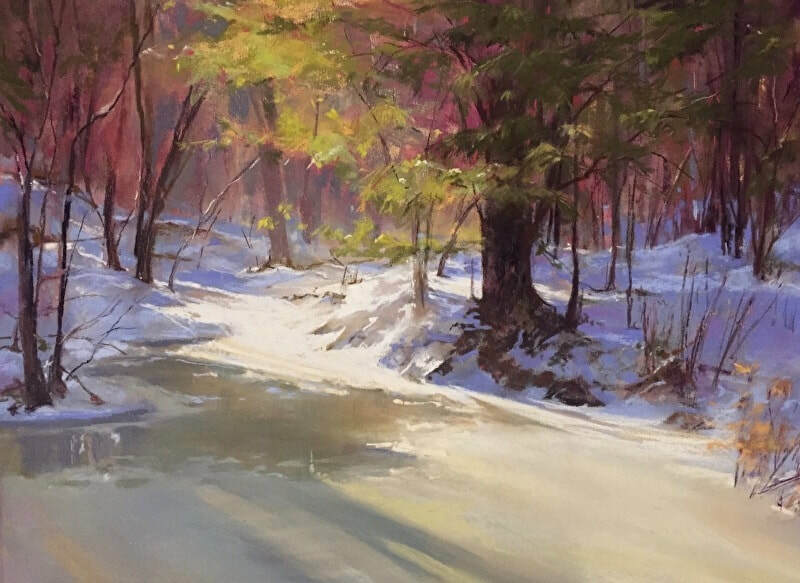 Crimmin has exhibited at the IAPS show in Albuquerque in June of 2013, as well as shows sponsored by the Connecticut Pastel Society (2013) and the Concord Art Association (2012, 2013). She is a signature member of the Copley Society of Boston, the Pastel Painters Society of Cape Cod, and the Pastel Society of America. "Diana’s Bath" just won a prize at the Connecticut Renaissance show, and "Lady in Waiting" is in a portrait show at the Copley Society in Boston. "After the Storm" is in the online Uart Spring Show. It also won the Award of Excellence at the Pastel Painters Society of Cape Cod Signature Show Spring 2017. PSST: Cindy, your paintings include oceans, landscapes and still life, all in different seasons. How does the variety in subject matter help you? How does your pastel palette change for each one? CINDY: One of the first questions for any artist is: Where do I start? There are so many options for things to paint, what speaks to me? Then, the more you look, the more beauty you see and the harder those questions are to answer. When I started to paint, I wasn’t at all sure what would be my path. I mostly just jumped in and saw where that first subject took me. As a student of Art History, I was always drawn to the high drama painters: Velazquez, Rembrandt, Sargent, Sorolla- the painters who really knew how to make things glow with life. Then time went on, I kept painting, and I realized that what I also seemed to be doing was chasing the light. The shine on fruit in a bowl, the glint in the eye of a portrait subject or reflections on mud puddle caught my attention. I have a complete set of and early series I lovingly refer to as “Light on Drainage Ditch.” So, I do paint a large variety of subject matter, from still life to portrait to land and seascape, but it is the light that unifies them all. PSST: Some of your paintings are tightly cropped architectural views that invite us to walk into the scene. How did you get this idea, and how do you turn the ordinary into sunlit beauty spots? CINDY: Also true of those high drama painters I mentioned is the use of diagonals and a willingness to experiment with unexpected horizon lines. As humans, we are naturally programed to respond to uneven ground and to watch for anything that might be unexpected. The effect of diagonal lines of composition and vanishing lines in unusual places is to pull the viewer into the composition. 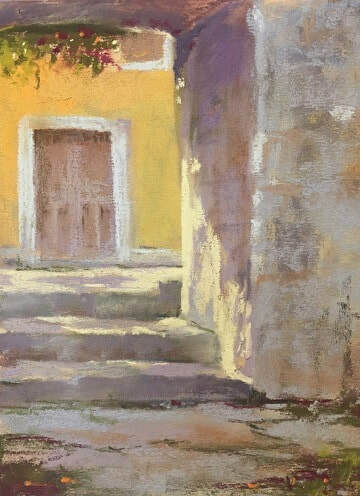 When the composition is “zoomed in” or there is something mysterious about the focal point (a slightly open door, a curve in the road with a hidden light source), the compulsion to “enter” the painting is even greater. The goal of a strong composition is to capture and to hold the viewer’s attention. PSST: Please tell your process of painting light and texture. CINDY: What becomes critical for painting light that feels real is color temperature. Often, we develop a personal palette by happenstance. That new box of purples and roses will send your work in a new and unexpected direction. Or you notice a combination of gold and neutral greens that speaks to you and you find yourself using it over and over. However, the trick is to remember that color temperature can make a huge difference to that palette. That purple palette when describing winter snow under trees needs to read more cool than warm. As the focus shifts to sun on the snow, you can tap the warmer mauves, adding a touch of peach to heighten the temperature even more. The same is true for skin tones in light and shadow. Is it older skin in bright cool light? Pink. Skin with light filtered through a summer hat? Coral. It makes sense that light and temperature are linked. Without both, your paintings will lack a certain level of life.When painting texture, the principles are the same. Texture adds interest to a composition if it is varied in placement and amount. Just as we are stimulated by diagonals and unexpected changes in shape, size and placement of objects, we also need a place for our eyes to rest. Often, it is the balance of textures that provides this rest. In “Diana’s Bath I, “ I balanced the texture of the rushing water as it falls over the rock with the smooth of the water below the falls. PSST: Is your painting time equal between outdoors and studio? Would you describe your studio setup? CINDY: In order to really understand light, you need to study it in the field. I never feel as if I take good paintings away from a plein air experience. However, I know that just painting outdoors makes me a stronger painter because I have spent my time studying light and color. This fall, I spent a week in Southern Italy mostly painting stucco walls in light and shadow. The paintings I did may be confined to a bin in the studio, but what I learned will inevitably show up in a painting soon. Living in New England, I know that I am facing many winter months of painting in my studio. During good weather, I try to paint outside as much as possible. Luckily, my studio space has two walls of floor to ceiling windows, so that I can pretend I am outside, even when the winds howl. CINDY: As a trained teacher for most of my life, the transition to teaching painting was natural. Two principles of good instruction in general are very present when I teach painting: Learners need models, and Learners profit from talking about the process of learning. We call the latter “metacognition.” When I teach, I focus on one or two basic take-aways for a class. We spend some time discussing the work of other artists that exemplify these themes so folks can see how many options there are for reaching a goal in an individual way. I demo my process to show how one artist arrives at the goal, and folks are encouraged to work on their own paintings. When at the easels, I respond to students’ work in light of the theme, starting where each painter is in his or her development. This allows painters at all levels of expertise a chance to discuss their work and to add to their repertoire. We end each class with a critique that encourages participants to articulate their thinking as they work. This allows each painter to solidify his or her thinking regarding next steps.